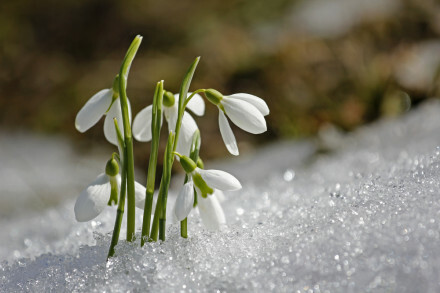 Snowdrops are the first flowers to appear, even when the ground is bitterly cold and icy. They herald the coming of spring and can be found between January and March. 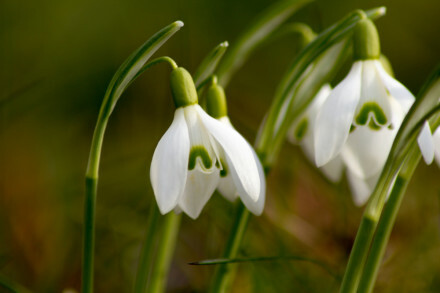 There are many different varieties but the variety commonly found in the UK is the Galanthus nivalis (or common snowdrop). 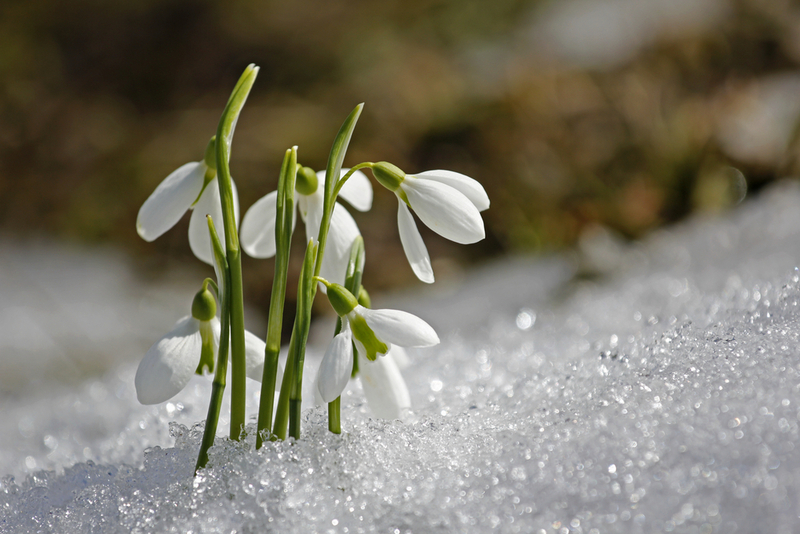 Woodland soil offers snowdrops the best conditions to grow and thrive. Bagthorpe Hall offers bed & breakfast and is located close to Sandringham and Burnham Market – and it’s only 15 minutes away from the coast. Bagthorpe Hall open their gardens on certain days of the year and in support of the National Garden Scheme. For more information visit the Bagthorpe Hall website. Brinton Hall is a beautiful place to visit at any time of the year. 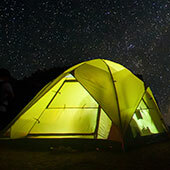 It’s located close to the Georgian town of Holt, 11 miles north east of Fakenham and 13 miles south west of Cromer, in the picturesque village of Brinton. The hall was built in 1822 in a Georgian style. Brinton Hall offers visitors spectacular views across the hall’s parkland towards the pretty water meadows. Beyond this are the woodlands that are awash with delicate snowdrops during the winter months. There are a number of walks to follow; these include the hall’s formal gardens with a hot house and lots of interesting plants, plus there’s the snowdrop theatre to explore. Visit the Invitation to View website for further information. The Blickling Estate is home to Blickling Hall which is located just outside the historic market town of Aylsham. The hall and estate has been in the care of the National Trust since 1940 and is a great place to visit at any time of year. Come and explore the winter garden at Blickling to see the snowdrops. Chestnut Farm is located in the pretty village of West Beckham. 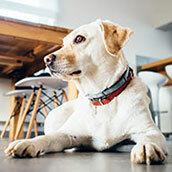 It’s only 2.5 miles from the coastal town of Sheringham, 7 miles from Cromer and 5 miles from the Georgian town of Holt. Chestnut Farm is a private residence. The garden has been created over 50 years by the owner who is an Artist Blacksmith. 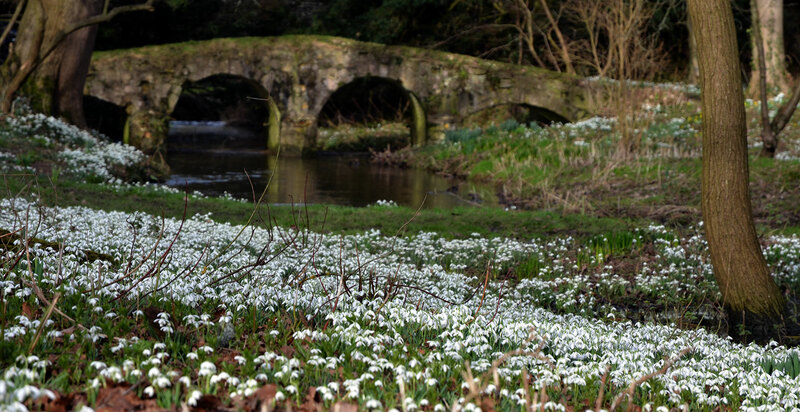 With over 90 varieties of snowdrops to see, the gardens are only open on certain days of the year. The owners are opening their garden to the public in support the National Garden Scheme. Horstead House is located in the village of Horstead, 9 miles north east of Norwich and 9 miles south east of the historic market town of Aylsham. The River Bure flows gently through this woodland garden; there are millions of beautiful snowdrops that carpet the garden and there’s a small walled garden to look around too. 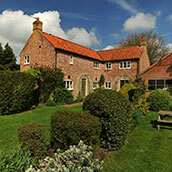 Raveningham Hall is located 14 miles south east of Norwich, 13.5 miles from Great Yarmouth and 4 miles from Beccles. The Raveningham Estate is mostly farmed and covers 500 acres. Raveningham Hall has been home to the Bacon family since 1735. The hall was built around 1750 and is a Grade II listed building. The gardens are only open to the public at set times of the year; here you can enjoy herbaceous plants and shrubs, the walled kitchen garden, the lake, conservatory and the herb garden. The owners are opening their garden to the public in support the National Garden Scheme. See also the Raveningham Hall website. Oxburgh Hall is a splendid moated country house in the village of Oxborough. It’s 10 miles from Downham Market and 17 miles from King’s Lynn. The hall is managed by the National Trust and was built around 1482. During the winter months there are guided walks all over the estate which includes the woodland setting with beautiful snowdrops in abundance. Plus, there’s also plenty of spring flowering bulbs, trails to follow and refreshments. Visit the NT Oxburgh Hall web page for more information. For many years St Margaret’s church in Thorpe Market has welcomed visitors to their award-winning conservation churchyard to see the snowdrops and aconites. Lexham Hall is an agricultural estate, close to Swaffham. It’s a private family residence and the gardens are only open for charity, during a small number of days per year. The Winter Garden at Lexham Hall is carpeted with both snowdrops and aconites. There are many of these early blossoming flowers all over the woodland garden and the woods adjacent to St Andrew’s Church (Groom’s Wood) – plus at the American Gardens on the furthest side of the lake and they can also be found in East Lexham. Go to Lexham Hall Events page for more information. Our favourite Norfolk location for snowdrops is Walsingham Abbey in the beautiful village of Walsingham, located halfway between Fakenham and Wells-next-the-Sea. Since the 11th Century the Abbey has been a place of religious pilgrimage. 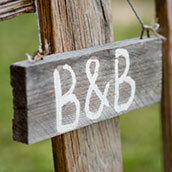 It offers visitors peace and tranquility amongst the priory ruins and the surrounding woods and meadows. An entrance fee applies. Visit the Walsingham Abbey Snowdrops page for more information.